Home› News › Winamp Theme Ubuntu! It’s 2014 and things have changed with how we listen to music, in fact, some aspects of the way we now listen and consume music have almost gotten wacky. Nobody buys a CD anymore, vinyl records are coming back strong, and services like Spotify offer millions of users instant access to most music in seconds. But if you’re like me, you probably have albums that are still not on spotify, so you still use a music player. Also, if you are like me, you like to kick it old school and rock nostalgia whenever possible. Back in the 90’s, we rocked out our monster speakers with Winamp. If you have Windows or Mac, it is still available. If you are using Ubuntu, you are out of luck, unless you want to run it in “Wine” which sort of blows. Fortunately, like almost everything in Ubuntu, there is always a way to get the same experience! 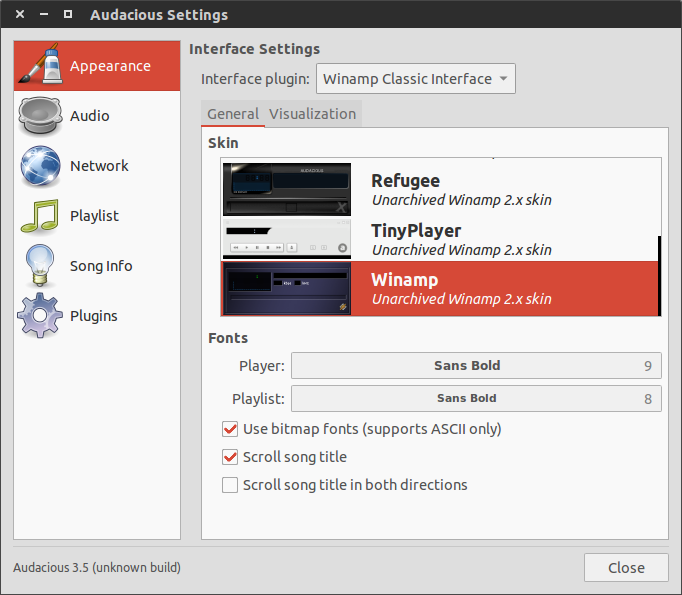 Audacious, is a music player for Linux which can offer that to you. It’s free, open source, and very quick. Here’s how we do it! Just select which one you want, and get busy! Check out my shop at supersweetshirts.com for totally awesome t-shirts that you will find nowhere else!